Reis, Brown and Berger, also known as the Shenango Iron Works, was built in 1845 by J.H. Brown, J. Higgs, and G. Thomas. It was christened the Oriza Iron Works and prospered until 1859. Due to the lack of adequate transportation, the business failed. It was vacant from 1859 until 1863. It was then purchased by Reis, Richards, and Berger. It was completely renovated with an improved rolling mill, nail factory, and furnace. When the railroads came to New Castle in 1864, the firm prospered. In 1864, W.H. 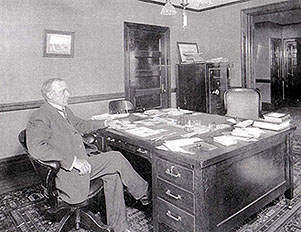 Brown purchased the interests of Mr. Richards. As more railways connected with the city, the firm continued to grow. It added an extensive brick works and new furnace (Little Pet and Rosena). 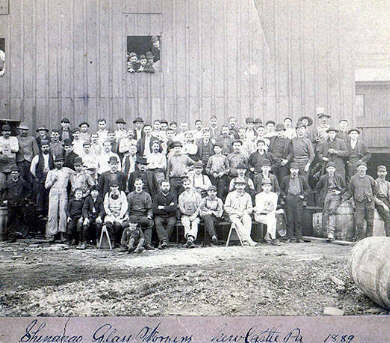 At one time, the plant was the largest employer in New Castle. In 1877, the payroll alone reached $45,000 per month. 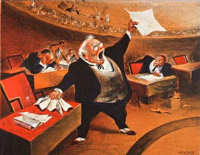 In the late 1890’s, two major trends undermined Amalgamated’s position. Steel replaced iron as America’s basic metal, making the skills of foundrymen obsolete. Steel makers also introduced new machines that could be operated by unskilled laborers. The union refused to admit these unskilled workers, many of which belonged to a growing population of immigrants. New Castle has a reputation for labor activism. 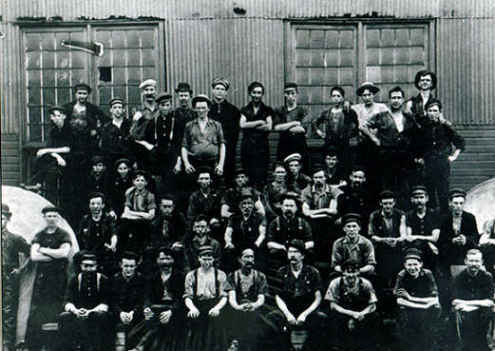 In the early days of industry, many local workers were members of Amalgamated Association of Iron, Steel and Tin Workers. Its members were primarily skilled or semi-skilled workers. 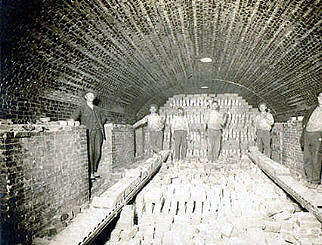 In the early 1900’s, New Castle was a one industry town. Individuals and families made decisions based on predictions of how the tin mill was running. Even local entertainment evolved around the mill. Children played at the company playground and attended movies at the company theater. 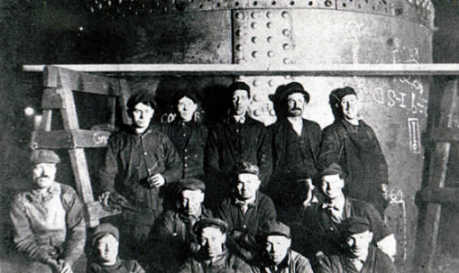 When the merger occurred in 1901, U.S. Steel was determined to eliminate the unions. This attempt failed in New Castle because of the harmonious conditions which existed in the mills. When the strike began, George Greer, a man described as forcefully independent, refused to bring in strikebreakers. Conditions drastically changed for organized labor by 1909. Mr. Greer had retired. U.S. Steel declared that it would no longer recognize Amalgamated. The strike that followed was long and bitter. Strikebreakers were called in and violence erupted. Many of the strikers never worked in the mills again. The national steel strike of 1919 effectively destroyed the union movement. It was not until 1937 that U.S. Steel would recognize the Steelworkers Organizing Committee which later became the C.I.O. During the years of the Great Depression, industrial strikes and incidents of strikebreaking occurred across the country, especially in the coal mining and steel production centers. Indeed, this was a time when social unrest had spread to all trades and crafts throughout America. By the mid-1930s, the nation had suffered more than 2,000 strikes. It is understandable, then, that the strike theme appeared so frequently in the art produced by socially- conscious artists of the period. New York artist William Gropper (1897-1977), who was actively engaged in support of the organized labor movement throughout his career, produced some of the most gripping social protest works of the period. Youngstown Strike (left) is one of Gropper’s most compelling works, apparently prompted by the extended strikes staged in 1936-37 by workers at the Youngstown Sheet and Tube Company, Youngstown, Ohio. During these years chaos frequently reigned throughout much of the city. In one incident, following a savage confrontation with police guards by workers and their families, the police tear gassed and shot at the workers; two strikers were killed and twenty-eight injured. Gropper visited Youngstown during this period, and commented on the incident in an article and a series of descriptive action sketches published in The Nation. What is particularly significant, however, is the fact that this painting depicts not the 1937 strike, but rather a similar incident that occurred in an early 1916 steel strike in Youngstown. This fact reflects the long-term commitment of Gropper, and of many other artists of the Great Depression, to depict past incidents that could logically serve to illustrate primary causal forces for the social disruptions of the 1950s. The 1916 strike at the Youngstown Sheet and Tube plant was declared on January 6 by the 8,000 employed workers, seemingly as a result of wage demands as well as the employees wretched housing conditions. On the following day, January 7, the strikers’ wives and other members of their families joined in protest outside the factories. In an attempt to disperse them, company guards employed tear gas bombs and thereafter fired into the crowd; three strikers were killed and twenty-five others were wounded. Gropper’s painting depicts the chaotic moment immediately after the shootings when the dead workers are lying on the ground and the shocked crowd expresses its outrage at the atrocity. The similarity between the conditions which led to this tragedy and those which had continued to prevail during the ensuing decades constituted Gropper’s message of anger and dismay at this crucial moment.